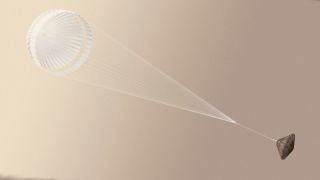 The Schiaparelli Mars lander deploys its parachute in this artist's illustration. The Schiaparelli lander, part of the European-led ExoMars 2016 mission, was supposed to touch down on the Red Planet this morning (Oct. 19) at 10:48 a.m. EDT (1448 GMT), but the spacecraft's handler's still don't know whether or not the historic maneuver was successful. You can watch a live webcast of the ExoMars landing here, courtesy of the European Space Agency (ESA). But there is good news already: The Trace Gas Orbiter (TGO), the other part of ExoMars 2016, slipped into orbit around the Red Planet as planned today after completing a crucial two-hour engine burn, ESA officials said. Schiaparelli is a technology demonstrator whose main purpose is proving out the landing system that will place the life-hunting ExoMars 2020 rover on the Red Planet's surface a few years from now. TGO was designed to scan the Martian atmosphere for methane and other gases that could be signs of life. ESA leads the two-phase ExoMars program, with the Russian space agency Roscosmos as chief partner.